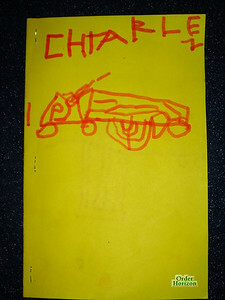 Charles has learned about staplers and has been using his new skill to make books and envelopes. You can see the cover of one of his books here. It was made from four folded sheets giving it 6 pages plus a cover and a back. Charles wrote on every page, although it was mostly pictures. Charles can “read” it and provide much detail for each of the pictures. I tortured poor Miss Darcy by sending it in with Charles so that he would insist on reading it there. Charles in turn tortures Dad with his new game. This consists of Charles drawing several windows (usually three) and then writing a letter (sometimes I can even tell which letter it is) and making Dad try to guess the word Charles is thinking of. This is sometimes a bit tricky, such as the time Charles wrote ‘F’ and the word was “Green”. You’re probably wondering about the windows, but I can’t explain them either as Charles has not explained them. They are, however, a critical component of the game and Charles always points them out when we start.